Square Wreath | Purchase Online | Free Shipping | 218.564.4909 | MN |. For a unique look, consider the 22″ mixed foliage, fully decorated Square Wreath. 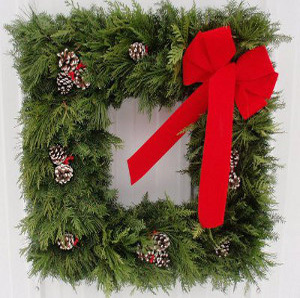 This wreath contains balsam, white pine and cedar boughs with a velvet bow, Ponderosa pine cones and holly berries.